We’re excited to announce the return of one of our most popular small-batch seasonal items: Ambre Blends Body Wash! That’s right, Ambre Blends Body Wash is back. This luxurious body wash lathers up for a fresh and clean feeling that will stay with you all day long. Our Body Wash is a healthy, rich, liquid soap serum that naturally cleanses and enriches your skin. With pure organic ingredients, it refreshes and enhances your body’s natural fragrance, making every individual wearer’s aroma unique to them. This seasonal release comes in a five ounce bottle, perfect for every day skin rejuvenation. Everyone wants soft and supple skin when they get out of the shower. Revitalizing, cleansing and 100% organic, our Body Wash will leave your skin clean and moisturized. The environmentally-safe ingredients provide nontoxic, pure benefits to Mother Earth, protecting the environment from intensive farming methods and chemical treatment of natural ingredients. These benefits are not only beneficial to Mother Earth but to you as well, as the organic ingredient benefits are passed on directly to your skin. Ambre Blends Body Wash contains a natural liquid soap base derived from organic oils and blended with gentle surfactant and skin-enhancing ingredients. Generous amounts of Ambre Blends Essences are crucial to the design of this product, leaving you with a sensual, alluring aroma. Lather onto your arms, face and entire body for a fresh, comprehensive cleanse. A small amount goes a long way, so don’t over-apply. Thoroughly shake before each use to better blend the naturally-separating organic ingredients. 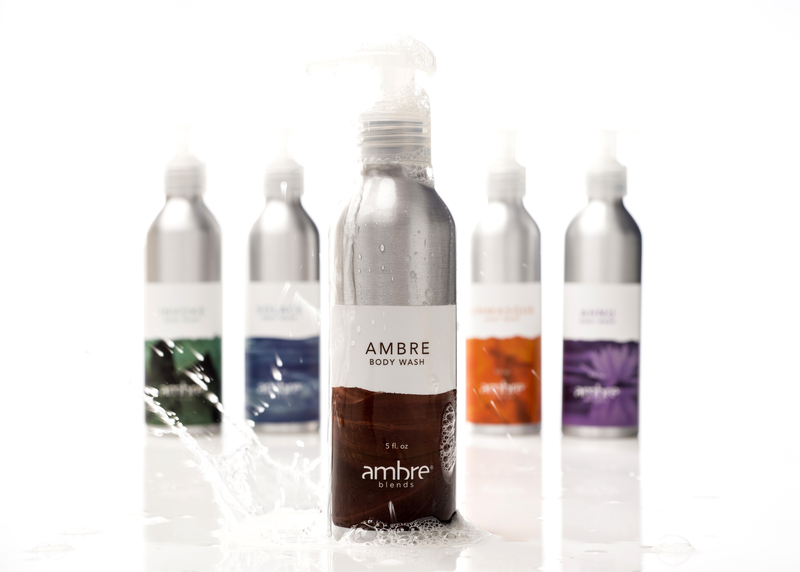 Ambre Blends Body Wash is available in all five signature scents and made with 100% organic ingredients. Handmade in Indianapolis, there are limited quantities available while supplies last! In line with our green business practices, the packaging is 100% recyclable.